We're Speaking at the Vizo Financial's Risk Management Conference! On April 18, Vizo financial will be in Hershey, PA hosting a risk management conference focused heavily on cybersecurity, 3rd party, and compliance risk topics that every risk manager can find useful. This 3 day event has 10 speakers that focus on specific compliance requirements and best practices that risk managers can utilize in their organizations. Your IT risk assessments are some of the most time consuming from your entire Enterprise Risk Management program. You probably have dozens, or hundreds of technologies that your organization uses, and you need to find a way to view your technology risk holistically, but through a thorough understanding of each one individually. Here are 6 things you can do in tandem with our new IT Risk software to make your risk assessment process efficient and effective. A little over 10 years ago the recession was developing with a burst of the residential mortgage bubble. Today, cyber risk has reached the level of global warfare, BSA and AML compliance remains a challenge, and third party risk continues to increase as we expand outsourcing. These and other areas can threaten and disrupt the strategic plans of the institution. While attending the 2018 ABA Risk Management conference I thought to share a few ways to protect your business strategy within your ERM program. Everyone has, at some point, told themselves “this is not a good time for _____”. Sometimes we fill in that blank like “this is not a good time to take on a new project, I have too much going on”. As an implementation manger here at WolfPAC, I hear this a lot, but is there ever really a good time to take on something new? 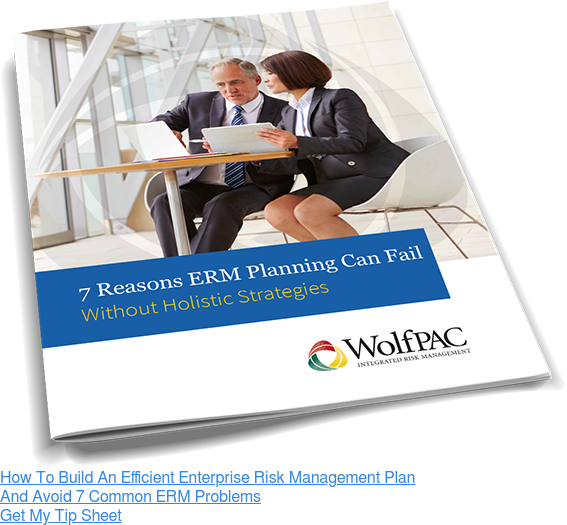 Have You Asked These 3 Questions To Your ERM Software Provider? You know a strong Enterprise Risk Management program is an integral part of making smart and safe decisions in your organization. This might mean that your business has invested in an Enterprise Risk Management software to help organize your program and create efficiencies around Vendor Management, Business Continuity Planning, Regulatory Compliance, and Information Technology risks you face every day. Join WolfPAC at the American Bankers Association Risk Management Forum! The American Bankers Association is hosting their annual Risk Management forum, and we’re so excited to be joining them! The event will be held at the Hyatt Regency in Orlando, FL. Building and maintaining a strong third party management program can be difficult. Your organization can have anywhere from dozens to (more likely) hundreds of vendors that need to be assessed, managed, and monitored to some degree. Also, as vendor relationships change, the information you have and the way you monitor them must also change. How the time does fly. It seems as though it was just a few short weeks ago that we were gathering together for our very first WolfPAC User Conference. A small group of clients met with our much smaller staff to talk about industry insights and software improvements. A year removed from President Trump’s inauguration, everyone is looking toward 2018 and trying to getter better idea of where the industry is headed. On March 8th, a group of internal auditor directors from banks all across California will meet for the Auditors Roundtable, hosted by the California Bankers Association. This group has been meeting for over 30 years, in order to gain valuable insights into the biggest issues they face at their organizations.